This large old homestead is just bursting with stories of days gone by! Aproaching 100 years of age, this homestead was originally used as a fisherman's bungalow, seaweed was even used in the ceiling as insulation! It comes from the era of pressed iron ceilings and beautiful open fireplaces with a recent addition being added for extra living space in 1990. Situated on a large double allotment with a massive elm tree for shade, opposite a reserve and just a very short walk to the infamous Port Willunga beach and Star of Greece Resturaunt this is a great family getaway! 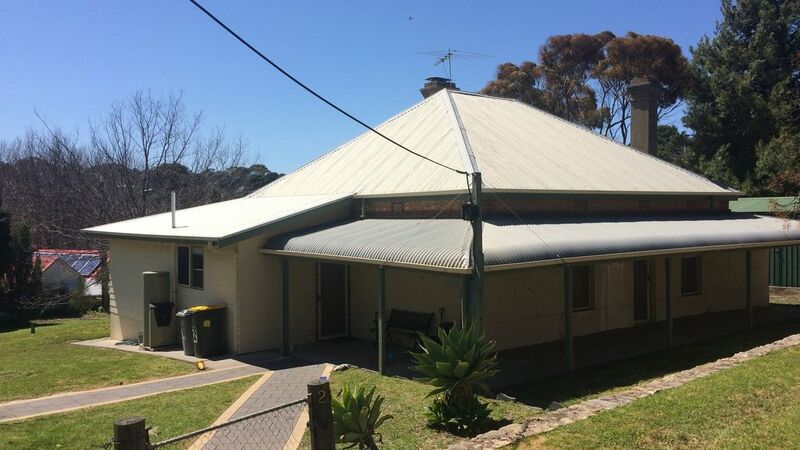 There has been significant upgrades to the property recently (2011) with the addition of heating and cooling in the main living area, carpets removed and floorboards polished, painting throughout and changes to the existing bedding and linen. - A spacious and renovated combined bathroom / laundry with two access via the kitchen and sunroom. Guests to refill gas bottle for BBQ if required. Min. 2 nights (except peak season). Contact owners if shorter stays are required. Prices incorporate a booking fee, cleaning and linen and are subject to change. Nestled on the beach in the heart of the famous Southern Vales wine region, the area offers the best of the coast and country and yet is an easy 50km from the heart of Adelaide. This cosy seaside haven is framed by the rolling Mt Lofty Ranges offering sweeping vistas that are carpeted by verdant vineyards with splashes of olive groves. With its protective reef shelf to the south and a broad bay on Gulf St Vincent, the area was once all about sailing ships but is now all sea change and holiday houses high on the limestone cliffs. A variety of beach experiences await within minutes of your doorstep - from the sheltered cove and surfing breaks of Port Willunga, the family friendly drive on stretch of golden sand from Aldinga Beach to Sellicks, the fisherman's friend and divers delight of the reef or the nudist beach at nearby Maslins. While the green and blue gulf waters below the cliffs mean lazy days on the beach for most, the area is also a focus for diving with a unique Aquatic Reserve established in the waters off the beach to protect a rare reef formation. Boasting international stars as local holiday house owners, these new denizens of seaside chic don't have to go far for a good espresso. The area offers renowned establishments including Star of Greece café with drop-dead gorgeous sea views, while nearby Cafe Salsa offers excellent sea side casual eating alternatives. This happy haven is also but a stones throw from the multitude of award winning wineries complimented by a smorgasbord of restaurants, coffee shops and galleries that meander through the nearby Southern Vales. As South Australia's best kept secret, the area offers the best of all worlds from perfect escapes for summer family holidays to winter getaways with wine tasting beside crackling fires or even hang gliding for the more adventurous. This rich relaxed tapestry is just waiting for you to discover - and once you had a taste of the fabulous Fleurieu you'll just keep coming back! Great place with plenty of character, location is great and very quite. Location is brilliant, absolutly peacefull, couldn't ask for quieter spot, very handy to first class beach, house really is a treat. Great beach just a short stroll from the house. House comfortable and well equipped. Very enjoyable stay. Would certainly return. House in great location, fantastic beach close by. House is well decked out and is very family orientated and affordable. Loved it and will be returning!